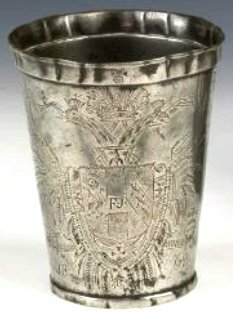 This 5 inch tall heavily engraved pewter beaker is called “The Austrian Imperial Beaker” (Or the “Maundy Thursday” Beaker). 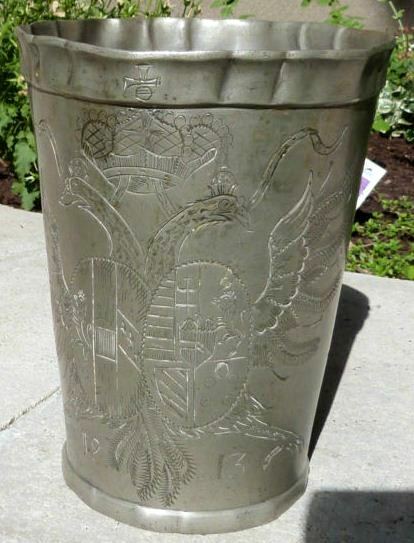 [WFTD] They were presentation pewter beakers from the Emperor / Empress of Austria, given to the 12 oldest men and women in the City of Vienna on the Thursday before Good Friday = “Maundy Thursday” each year. 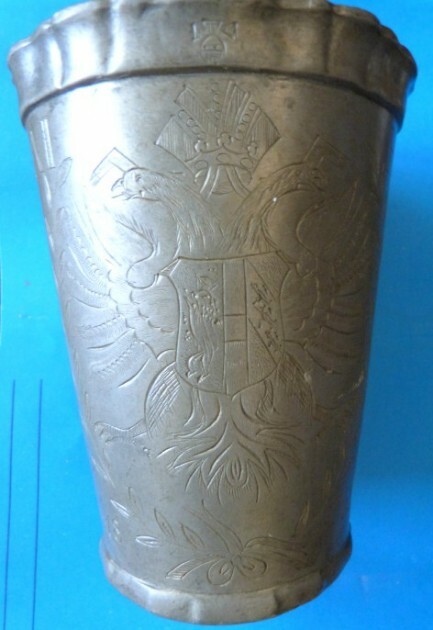 AS the Austrian Kings claimed to be the end of the line of the Holy Roman Emperor and used the double headed eagle in their State arms; some might call this a Holy Roman Emperor’s beaker. Most historians of course would not agree – but worse things have been wrongly called within the steon collector’s circle! This beaker’s maker’s mark is” “C NEBBIEN” – “S:W: FEINZIN” and is double stamped on the bottom of the beaker. Of course there were many different Master pewter-smith’s marks over the years. This beaker presentation was after Franz Josef washed the old people’s feet! The Emperors of Austria believed they were the descendants of the Holy Roman Empire (HRE), and as Christianity was the HRE’s religion, this was symbolic of Jesus washing the feet of his disciples. 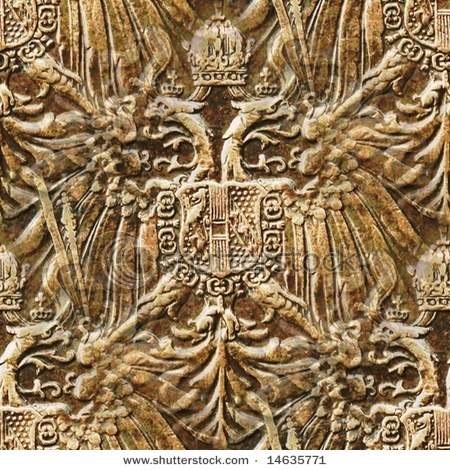 The belief of being the HRE is also shown by the adoption of the double headed eagle standard, started by Charlemagne. 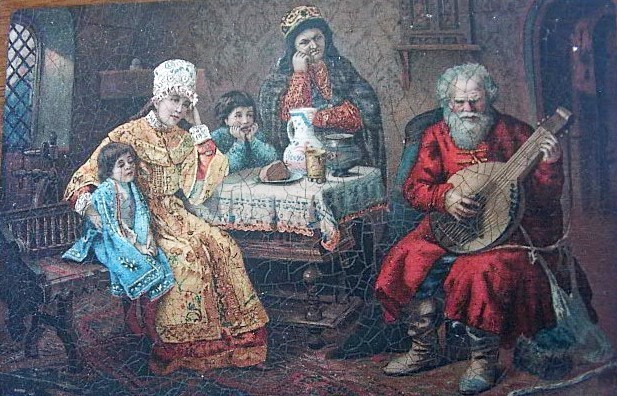 The Emperor also gave the old women 24 gold coins and the men 12 (I guess because they weren’t going to live as long = ?) This custom started with Maria Theresa so there were lots of a few of these made, but not many still out there. There are not many of these shown in the US literature. 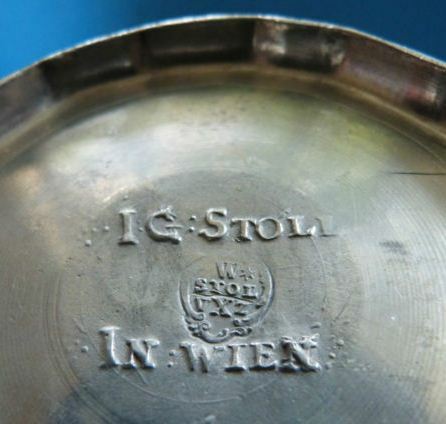 I found my first reference in the book titled “National Types of Old Pewter” [a revised and expanded edition by Howare Herschel Cotterell, Adolphe Riff and Robert M. Vetter. The book was published by Weathervane Books, New York in 1972.] This beaker might be rated a 5 (Uncommon ) on the Smith-Paratore rarity scale. There was a recent offering on eBay for two of these beakers. What made them of sincere interest to me is that both were initialed (named) for the ruling Empress at the time, and not the Emperor. Detail of Empress Maria Ludovika arm’s. A very unusual Maker’s mark, molded relief and not stamped. 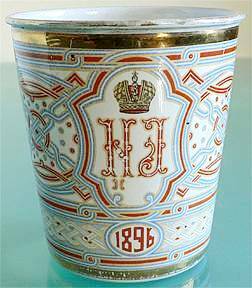 1861 is the date on this pewter beaker and it is initialed: EAI HBRAA = Empress Elizabeth François. 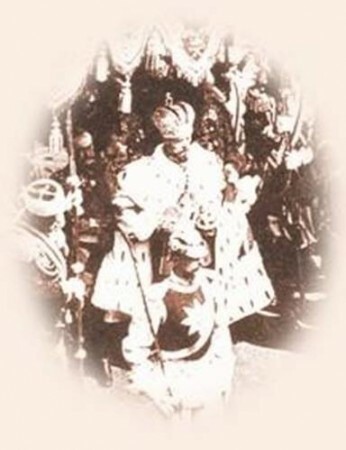 She was the mother of queens and a daughter to an Archduke and a sister to yet another queen. Born in 1831, she had six children from 1855 to 1864, with her second husband, her first cousin Archduke Karl Ferdinand of Austria. ……………………………………………………………………………………………………………. 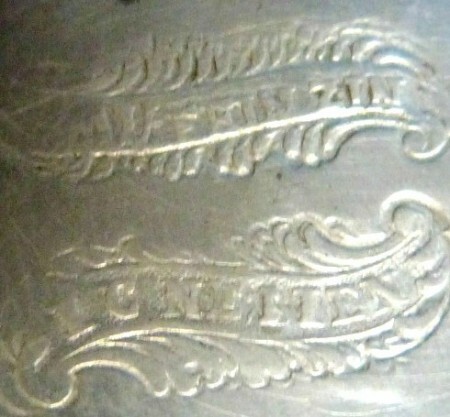 Detail of the maker’s mark, same pewterer as on the Emperor’s beaker, done in 1853, far above. These, indicate to me that both the royal members were involved in this ceremony, although I can’t picture the Empress(s) washing the old people’s feet. 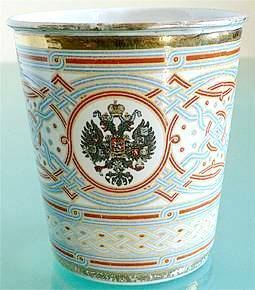 There are several stories out there in “www.land” about how exactly this cup got its name, etc. They all refer of course to the Coronation of Czar Nicholas II of Russia, for which occasion it was made. Only the details of the place the incident occurred and the number of dead varies. Nicholas II, Czar of Russia. 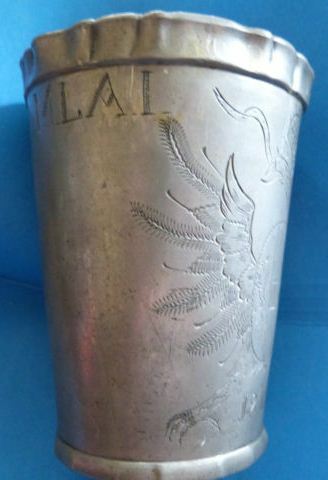 I have been unable to ascertain the distributed total amount of these type coronation cups (there were other types made.) None of these are signed by the maker that I am aware of. The price range varies widely, from $600.00 to $1500.00, even with essentially the same condition. The perfect ones are almost all in European Museums.